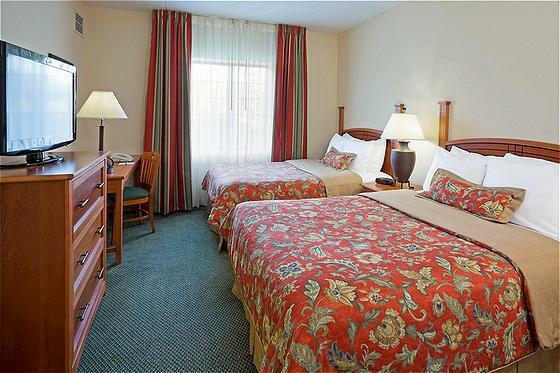 Get comfortable at the Staybridge Suites Hotel Eatontown Tinton Falls. Staybridge Suites is a member of the IHG family of brands, which also include InterContinental, Crowne Plaza, Hotel Indigo, Holiday Inn and Candlewood Suites. Conveniently located 4 miles from the Jersey Shore, and driving distance of Atlantic City, Philadelphia & New York City, Staybridge Suites Hotel Eatontown is the ideal choice for all your hotel needs. We are located in Eatontown off Route 35, just minutes from PNC Bank Arts Center, Monmouth Park Race Track, and Six Flags Great Adventure. Select Staybridge Suites Hotel Eatontown when visiting Fort Monmouth, or any of the Government contractors in our area. Within a few miles you will find the Jersey Shore, Asbury Park, and Monmouth University. The Staybridge Suites Hotel Eatontown Tinton Falls offers apartment like suites with all the conveniences of home to suit your extended stay or short term hotel real estate needs. Our pet friendly hotel (fee) offers studio, 1 or 2 bedroom apartment like suites featuring fully-equipped kitchens, spacious living & work areas, TV w/HBO, free wired & wireless Internet access & direct dial phone numbers w/ personalized voicemail. Other features include 24 hour business center w/ print/copy capabilities, library, free guest laundry facilities, fitness center, outdoor pool w/ whirlpool & a courtyard w/ gas BBQ grills. Daily complimentary deluxe breakfast bar & dinner Tue, Wed, & Thurs This hotel is committed to providing accessible facilities under the American Disabilities Act. If your accessibility needs are not met, please contact the Hotel Manager on Duty. Should you require additional information regarding accessible facilities for guests with disabilities, please call 1-800-Holiday (U.S. and Canada) or contact the hotel directly. For the hearing impaired, TDD service is available at 1-800-238-5544 within the U.S. and Canada.